Still, it is measurably more compact, and with the same general design and material composition, just as functional and durable as the original. Plus, the Voodoo Mini is about a sawbuck less expensive than the original Voodoo, and like its big brother comes with a nylon, snap closure sheath. 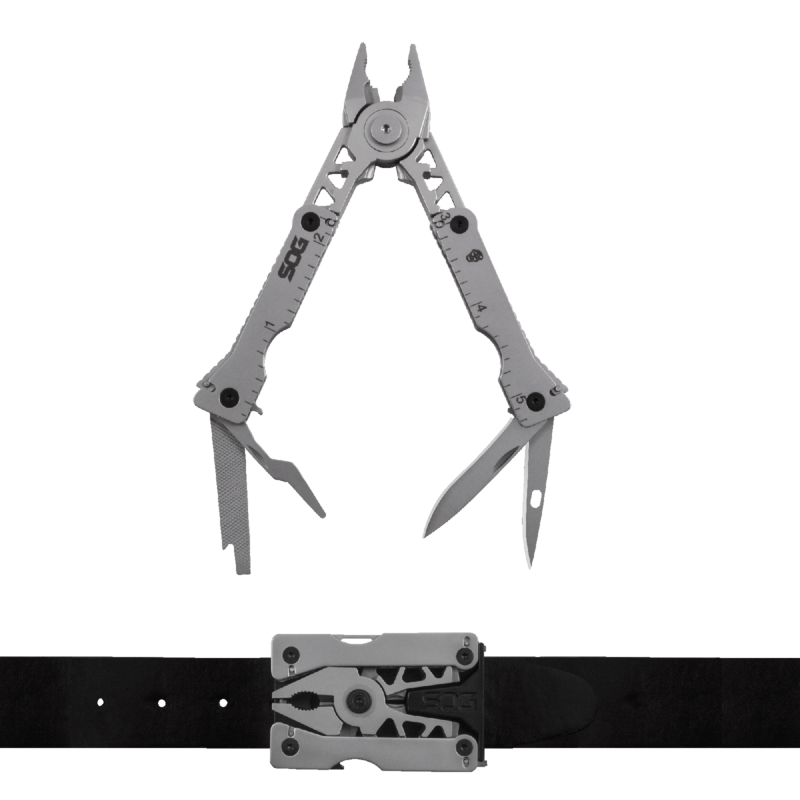 The PowerAccess Deluxe is a new multitool from SOG Knives. Made of 5Cr15MoV steel with a stonewash finish, the PowerAccess Deluxe has 21 tools, as well as a 12-piece hex bit kit, and the components can be opened while keeping the tool closed. 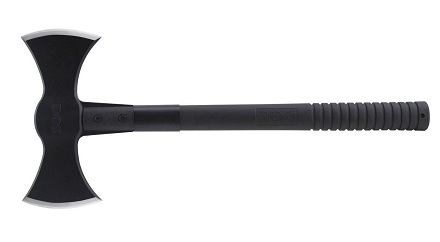 This tool utilizes SOG’s compound leverage gripping power. With this feature, and the wire cutters, we were able to slice clean through a penny the rep had on hand. Another cool feature of this and other tools in SOG’s new line is the ability to retain a bit while the tool is closed. Here’s a shot of the PowerAccess Deluxe fully extended. Awl, Straight-Edge Blade, Bolt/Nut Gripper, Bottle Opener, Crimpers, 3-Sided File, Flat Screwdriver, Jewelry Driver, Pliers, Ruler, and Wire Cutter. The new Baton multi-tool series from SOG consists of 4 minimalist profile multi-tools, about as thick as a marker and as long as a pencil for easy stowage into a pocket, pouch, or other container. Each tool in the series is named ‘Baton Q’, followed by a number (Q1 – Q4). The Q tools consist of handles made of aluminum (Q1 – 1060, Q2-4 – 6061-T6) and tools made of 5Cr15MoV steel, and depending on the model are designed for applications including office & personal, urban emergency, and basic and advanced wilderness. 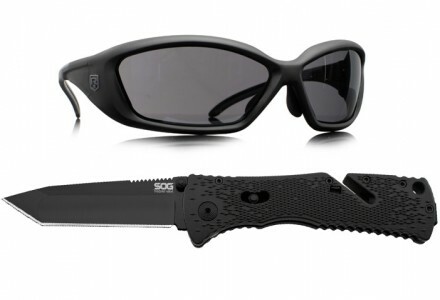 Revision has partnered up with SOG Knives to offer a special holiday sale combo: purchase a pair of Hellfly ballistic sunglasses with a SOG Trident Mini folding knife and receive a special discount, a total savings of 57% off MSRP for both items individually. Like all good things, this deal will come to an end – its available until December 16 or while supplies last (only 500 total). After a couple of delays, the SOG Voodoo Hawk Limited Edition has started shipping. However, the MultiCam sheath is delayed due to a quality control issue found by the manufacturer. 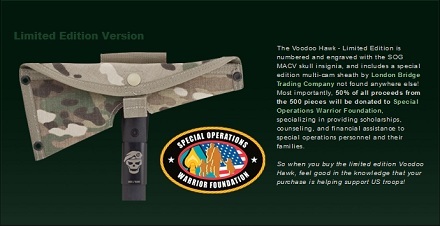 The sheath should start shipping separately starting December 7th to anyone who purchased a LE Voodoo hawk. Just a quick announcement that the SOG Voodoo Hawk is available for pre-order, which includes the 500-piece run limited edition model seen above. Some changes from the original planned Limited Edition include a MultiCam sheath and a SOG MACV skull insignia. Additionally, 50% of the proceeds from the 500 pieces will now go to benefit the Special Operations Warrior Foundation. Soon to be joining SOG’s Blade Light Fixed is the Blade Light Folder (BLT50-N). Featuring a 9Cr18MoV stainless steel 3.9″ blade and a rubberized glass-reinforced Nylon handle, the BLT50-N has 6 LEDs molded into the handle, providing up to 37 lumens of light with a 4.5 hour runtime off two AAA batteries. The blade folds into the handle with a liner lock design, which also allows the Blade Light folder to be used as a flashlight. Available this October. Looking to add something a bit more Medieval to your blade collection? Then now’s a really good time, since LA Police Gear is currently having an overstock sale on the SOG Double Axe. 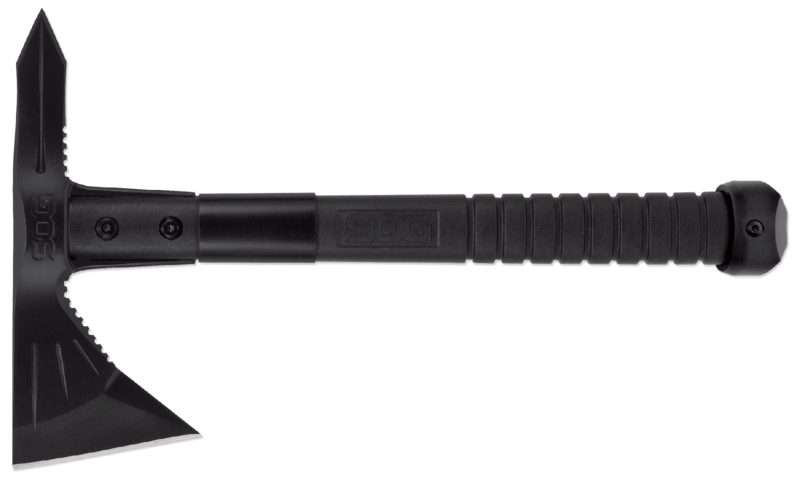 The double-bladed head is constructed of 420 stainless steel and features a ballistic polymer handle with a hardcased black coating. It’s the perfect tool for harvesting wood, breaching, extraction, and fighting off the crowds at your local renaissance faire*. At the current price, these axes are sure to go fast, so get yours while you can! *For best results, pair with a set of full-body plate armor.